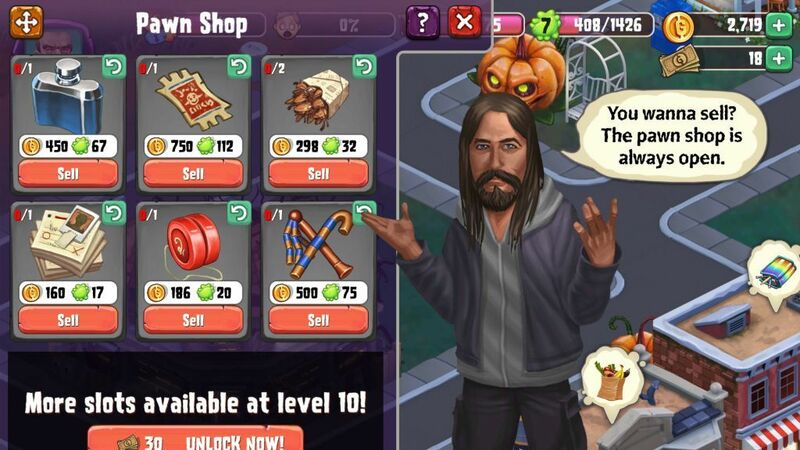 In Goosebumps HorrorTown, players can craft items and sell them at the pawn shop to get more coins and XP. Combining two or more materials adds value to the item. The more valuable/rare the item, the more coins you will earn. As of writing this article, there are two craft shops – “The Many Mysteries Club” and “The Monster Diner”. As you level up, you will be able to expand your horror town to discover more craft shops. At the Monster Diner, you will find delicious roach recipes. You can craft and sell them at the pawn shop to receive coins. The Many Mysteries Club contains a list of items useful for spying on monsters and solving mysteries. These items can also be sold at a very good price, but many times, you may need them to complete hero missions. For example: To complete Lucy’s “Creature Teacher” mission II – 4, you will have to obtain a fingerprint registry which can be crafted at the Many Mysteries Club. As you level up, you will unlock more recipes in these shops. This Goosebumps Horror Town guide will help you find materials for crafting items and show you how to sell them at the pawn shop. You can also watch our short tutorial on crafting and selling items. First up, let’s explore the Monster Diner. 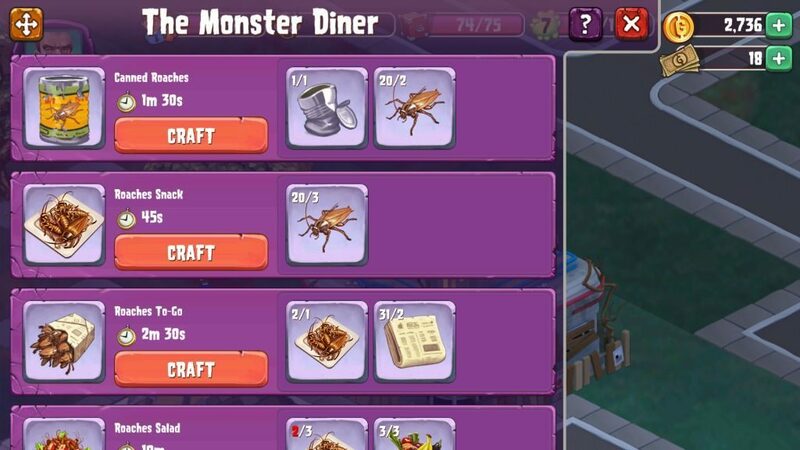 The primary ingredient of Monster Diner is a cockroach. You will have to place a Garbage Dumper to get cockroaches. The dumpster drops a roach in every 1 minute 30 seconds. You can also get a cockroach if you get Mr. Mortman, the librarian, to perform an action (also known as “animation” in Horror Town). Complete Mortman’s “Dive a Garbage Dumpster” animation to get a roach. Just tap a walking Mortman to get a list of animations. Canned Roaches: 2 cockroaches + 1 Tin Can (Get this by completing Dustin’s “Shoot Cans with a Slingshot” animation. Tao Dustin’s walking character to get a list of actions). Completion time – 1 minute 30 seconds. Roaches To-Go: 1 Roaches Snack + 2 School Newspaper (Get this by having Lucy perform “Read the School Newspaper” animation. You can also get the school newspaper from the “newspaper stand” every 60 seconds). Completion time – 2 minutes 30 seconds. Roaches Salad: 3 Roaches Snack + Grocery Bag (Get this by performing Mrs. Dark’s “Make the Neighbor’s Jealous” animation). Completion time: 10 minutes. Leftover Stew: 2 Roaches To-Go + 2 Canned Roaches + 1 Roaches Salad (all these have to be crafted first before using them to make leftover stew). Completion time: 30 minutes. Grilled Blob: The only recipe that does not need roaches. You will need two “blobs” to craft this recipe. You will get blobs by spawning the mummy from The Crash Site. Those were some of the yuckiest recipes that can earn you coins and XP if you sell them at the pawn shop. Recipes that require rare items/materials and more time to finish usually sell at a higher price. The Can Telephone: 2 Tin Cans – Complete these actions: Dustin’s “Shoot Cans with a Slingshot” and Mr. Mortman’s “Accuse Dustin with His Mom” and “Control the Hiccup Attack”. You can also get the can telephone directly if you complete Justin’s “Be the Best at Skateboarding” action. Evidence Record: 2 Investigation Files + 1 Flashcard (Complete Lucy’s “Pieces All the Clues Together” action to get a flashcard). Fingerprint registry: 2 Pencil Case + 2 Makeup Kit + 1 Evidence Record. You can get a pencil case if you complete Mrs. Maargh’s “Prepare Third Grade Class” animation. To get makeup kit, complete her “Have an Outburst of Anger” animation. You will also get both these materials if you complete Mrs. Dark’s second and third animation. Tap a walking Mrs. Dark to access a list of actions. Spyglass binoculars: 1 Tin Can Telephone + 2 Magnifying glasses + 1 pencil case. Complete Lucy’s “Search for Strange Clues” action to get a magnifying glass. Also, perfom Dustin’s “Burn Ants from Outer Space” action to get it. Cardboard Periscope: 1 Spyglass binoculars + 2 pencil cases + 3 makeup kits. 1. Newspaper stand: Newspaper. 600 coins. 2. Garbage dumpster: Cockroaches. 1200 coins. 3. Waster Container: Tin Cans. 40 bills. 4. Margot’s Food Stall: Roaches Snack. 60 bills. 5. Beauty Store: Makeup Kit. 40 bills. 6. Toy store: Produces Yo-Yo. 1500 coins. 7. School Supplies Store: Pencil Box. 2100 coins. 8. Grocery Store: Grocery Bag. 2100 coins. 9. Watch Tower: Investigation file. 60 bills. Carl’s Leftover Stand: Leftover stew. 100 bills. Note: Bills are premium currency. You can get them by collecting scary faces by frightening people in Goosebumps HorrorTown. Fill the Scare-o-Meter to get them. You can also get bills by watching a video, completing a character’s story or by logging into Facebook. You can also sell individual items, such as pencil boxes and yo-yos at the pawn shop. The shop shows a list of random items and sometimes you won’t find that item you are willing to sell. Juts tap the curved arrow icon above each item to get a new sale listing. You will have to wait for a few minutes to get another item. You can also expand more item slots by reaching certain levels. Selling items crafted at the diner and club is a sure shot way to get lots of coins and XP. You will be able to level up quickly and use coins to expand Horror Town, construct more buildings to scare people and unlock extra features to make your town scarier and more dangerous to live in.